Like shoes and jewellery, there’s never such a thing as having too many handbags. With its wide selection, Bentley bags is perfect for adding final touches to any outfit and can even work as an everyday necessity. As a special Valentine’s Day bonus from them to you, save an extra 20% off handbags until February 14th, 2013. The Bentley Bags coupon page also has a Vouchercodes.ca Exclusive code to save you an extra 10% off your order. Yes, they do stack! The 20% off discount on handbags is applied automagically to your bag. 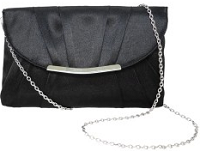 Add some bling to your outfit with this black evening bag featured on the right. It has a diamond accent and metal strap to hang over your shoulder with ample space to hide your cell phone and emergency lip stick. This sparkly handbag comes out to $14.39. Prep yourself for the warmer months with a pretty white satchel that will carry all of your day to day items: wallet, keys, tampons, change of clothing….you name it and it will most likely fit in there! Grab this one for $10.79 after all the rebates. Orders over $50 also qualify for free shipping. What are you going to grab?